"They’re really substantial cards for play time. Izabelle’s eyes really lit up when she saw them, really focusing on the black & white drawings." "They’re going to be great for us to use for years to come. Izabelle loves holding them & looking at the patterns. They’re great for her development too!" "This is how Wee Gallery started. 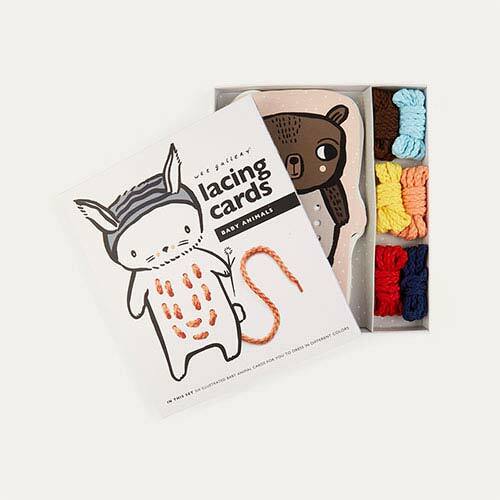 These art cards filled with captivating animals, turn their cribs into wee galleries. Also great as flash cards for older tots." Babies love black and white. It helps them engage and learn too. So they’ll love this cool set of art cards. Including a range of animals printed on sturdy board, these cards are great for getting them learning early. Each card is finished in matte laminate and has rounded corners - just in case bubs decides to give them a lil’ chew, which they will, because, well babe’s love to chew.